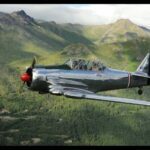 Wings of Freedom, founded by Mr. Chuck Miller, is dedicated to providing a collection of flyable warbirds that played a role in shaping Alaska’s aviation heritage. 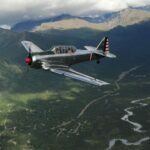 Housed in a WW-II era hangar at Merrill Field, Wings of Freedom will be providing a T-6 and L-13 at Arctic Thunder 2016. 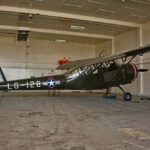 Wings of Freedom had previously been the home of one of the world’s last remaining Mitsubishi Zero, which flew in the 2012 Arcitc Thunder Air Show as well as in the 2013 Alaska Aviation Centennial Celebration. The AT-6 Texan is a single-engine, advanced trainer aircraft used during WWII. The prototype first flew in 1935, and the first models were put into production in 1937. 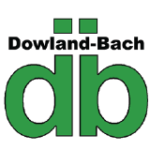 More than 17,000 were built. The aircraft being flow at Arctic thunder was built in 1943, and is in the Aleutian colors of aircraft flying there in WWII. The L-13A was manufactured by Consolidated Vultee, and first flown in 1945. It was used for observation, liaison, and air ambulance duties. Like the L-2, man were later converted for civilian use in the Alaska bush.